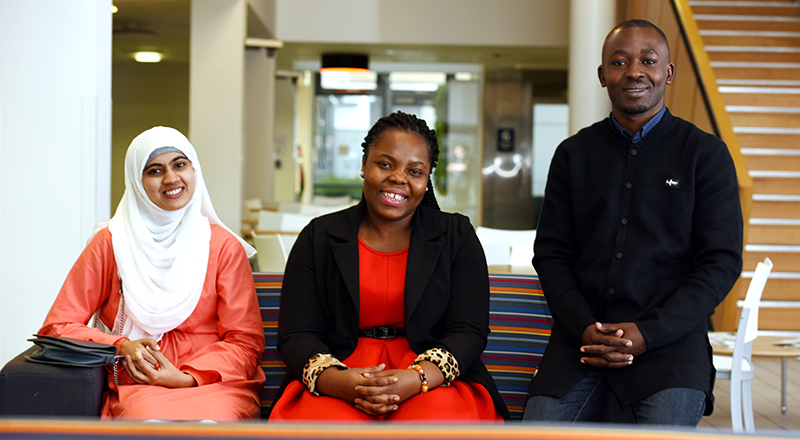 Teesside University has welcomed a number of new international students via a prestigious scholarship programme designed to enhance opportunities for talented and motivated individuals from across the globe. Dr Saba, Priscilla Botchway and Edward Kulubya. In total, Teesside has been successful in securing 10 students through the Commonwealth Scholarship. Five will spend a year at the University completing master’s degrees, while the other five will study programmes via distance learning. The Commonwealth Scholarships are open to students from the least developed and lower middle income Commonwealth countries and are aimed at high achievers who otherwise may not be able to afford to study in the UK. Teesside secured 10 scholarships in the health systems and capacity strand and they will be part of the University’s School of Health & Social Care. The Scholarships are funded by the UK Department for International Development with the aim of supporting sustainable development in commonwealth countries. Edward Kulubya, 31, from Uganda, is studying for a Master’s in Public Health, (MPH), after completing a degree in sports and exercise science. He said: 'I have always wanted to study in a different country and after following Teesside University on social media, I was really impressed with what I saw. Dr Saba, 25, from Pakistan, is also studying the MPH and opted for Teesside after seeing the University continually climb the league tables. 'Teesside was recommended to me and I saw that it was climbing the rankings every year and also scored highly for international student satisfaction,' explained Dr Saba. We provide a wide range of opportunities for international students who come to study at Teesside from all over the world. Also studying the MPH is Priscilla Botchway, 29, from Ghana, who completed a degree in diagnostic radiography in her home country. Lawrence Nnyanzi, (Senior Lecturer in Research Methods), worked on the bids for the Commonwealth Scholarships and was delighted to be able to secure 10 places. 'They are really prestigious scholarships and to be successful in acquiring ten for Teesside is a fantastic achievement for the University,' he said. Dr David Bell, Pro Vice-Chancellor (International) at Teesside University, said: 'We provide a wide range of opportunities for international students who come to study at Teesside from all over the world.